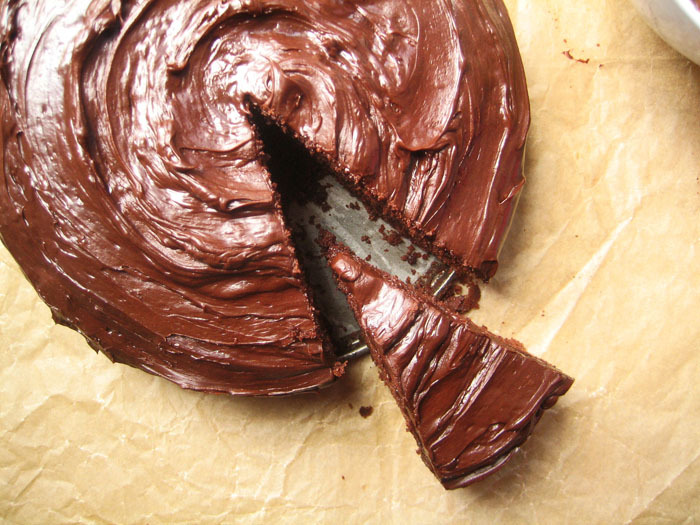 I wrote this long worded post relating this lovely Chocolate Cake to a Little Black Dress. Then a not-so-lovely slight of hand and accidental click of the mouse made me lose the whole thing. 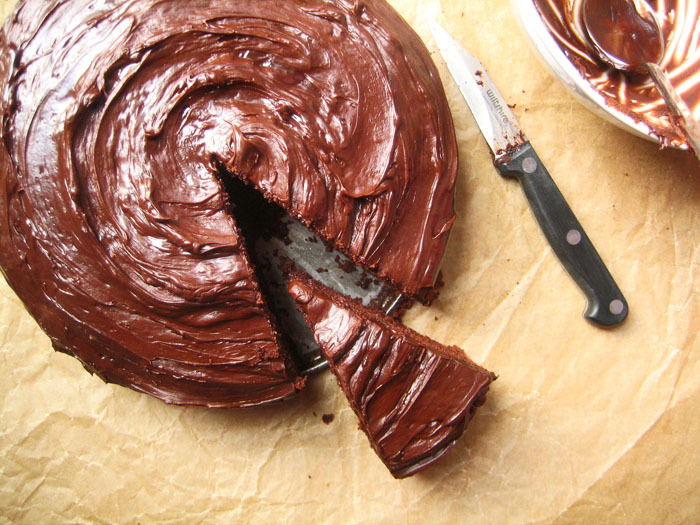 A simple chocolate cake is as essential as a Little Black Dress. If it's not already there, put one in your repertoire. I promise this shouldn't take more than 8 minutes from kitchen counter to oven rack. Believe that. Casual and classic is the name of the game and no fuss shall be made. Effortless is key so one bowl and a whisk is the extent of our tools. 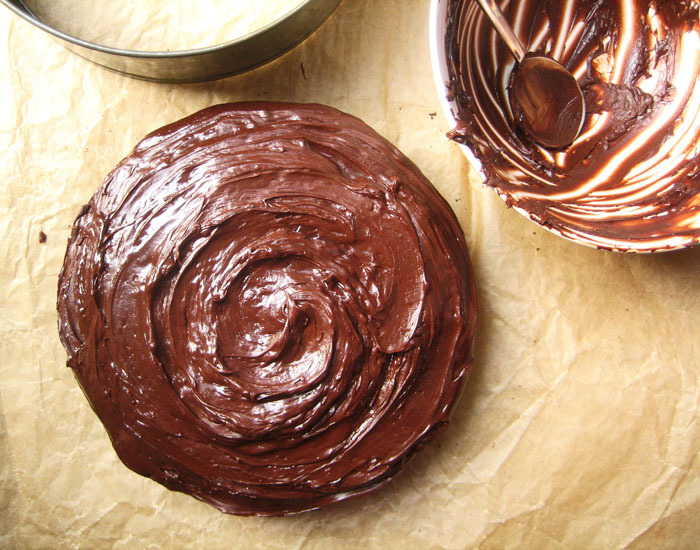 No accessories needed - a simple fudge frosting will do. It starts off silky and glaze-like and firms up as it spreads and cools into a fudge-like consistency. Whenever the word fudge is involved, I'm ALL ears. This is the one you keep in your back pocket for a Tuesday night. People will think you've been doing this for years (and even if you have, play it up even more). However... to give a feeling of "hey, I'm baking here", we'll sift the dry ingredients. Sifting does only good things for cake - it helps to disperse fine flour particles and break up lumps of cocoa powder so that a smooth batter comes together quickly and evenly. Ultimately it minimizes mixing time, which helps to create a tender cake. What helps this become so nice with so little investment? Combining the flour thoroughly with sugar. Sugar competes with flour for water so that it prevents the protein molecules from absorbing too much water (from milk, yogurt and eggs) and creating excessive gluten. Gluten will make a strong cake. 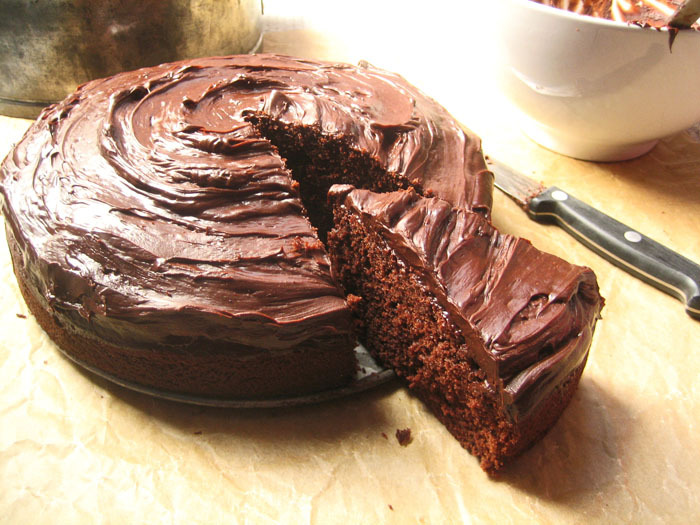 And, although we want to make a strong statement with a black dress, we want to make a soft and tender cake. Let's make that clear. If you have 8 minutes to spare, I'm assuming you're making this cake. A rather tasty assumption, I must say. Dig it! Preheat your oven to 325 degrees F. Line an 8-inch round cake pan or springform pan with parchment paper and lightly butter the sides. 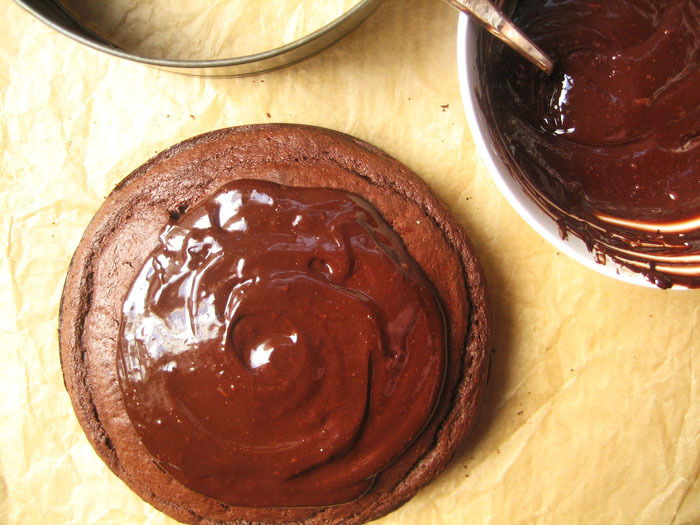 Melt chocolate and butter very gently in a saucepan over low heat. Stir constantly until smooth and set aside to cool slightly. Sift flour, sugar, cocoa, salt and baking soda into a large bowl. Whisk to blend evenly. Add chocolate mixture, eggs, yogurt, milk and vanilla extract to the flour mixture and whisk just until batter is smooth. Do not over-mix. The batter will be very thick and luscious. To make the frosting, combine chocolate, butter and milk in a double boiler. Heat it gently without stirring until the chocolate begins to melt. Begin stirring until smooth and glossy. Remove from heat and set aside for 15 minutes. Add salt and beat with electric mixer on high speed for 30 seconds. Set aside to cool and thicken but keep an eye on it as it will harden quickly and be difficult to spread. If this happens, re-warm it gently. Spread frosting all over top of cake and serve. Hello! I think your article was well-thought of, and I applaud it for that. However, I would think that your main topic covered in it may need explanation. Would you mind sharing more about this to us soon? My friends and I would love to hear from you! Cheers! can i change yoghurt into creme fraiche? Tried this yesterday for a friend's birthday and was thrilled with the outcome. Everyone loved it! Can't wait for another birthday to come around!